So, what is the question that always gets asked today, around the world? Who, how and when was the first aloha shirt created? In a 1966 Magazine article, Hope Dennis, a journalist and textile designer wrote; “About 35 years ago an astute Hawaiian garment manufacturer (who shall remain nameless to avoid renewing a 35 year old argument) designed the first aloha shirt, “ launching what was to become the golden age for Aloha shirts – the 1930’s through the 1950’s. Koichiro Miyamoto, known as Musa-Shiya the Shirtmaker, measures out a length of a beautiful lobster print fabric. In downtown Honolulu, Dolores Miyamoto, was the wife and working partner of the tailor, Musa-Shiya the shirtmaker, Koichiro Miyamoto. She remembers making shirts for Shirley Temple in the 1930’s. She recalled John Barrymore coming into the store in the early ‘30’s pointing at the original Japanese Kabe Crepe fabric and ordering a custom shirt for himself, which had never been requested by any other customers. Until that moment, the Musashiya’s had not made a printed shirt. 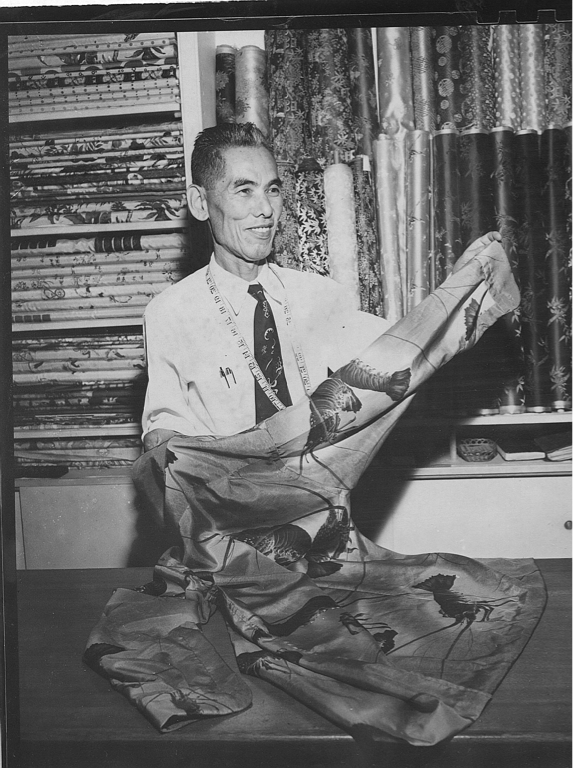 One of the most well known stories about the Aloha shirt’s beginnings is certainly the story of the Chun family and King-Smith Clothiers. In a 1964 interview, Ellery Chun recalled that local boys wore casual shirts made of Japanese challis and local Filipino boys wore brilliantly colored shirt-tail-out shirts known as bayau shirts. He recalled having a tailor make his first printed shirts out of brilliant and gaudy Japanese kimono material in 1932 or 1933. Many of the beach boys also went to tailor shops with visitors for custom made shirts, and it was Ellery’s idea to have ready-made shirts hanging in stock at his father’s store, King-Smith Clothiers. 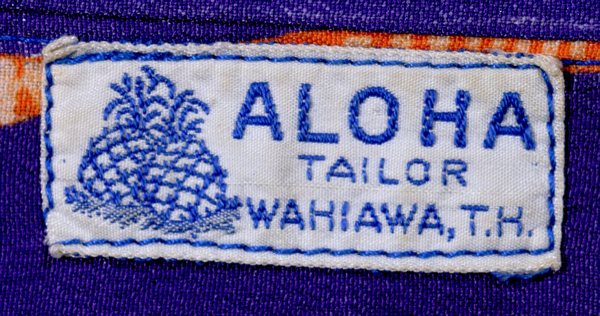 In a store window, he placed a small sign, “Hawaiian Shirts.” Ellery was the first to register the trademarks, “Aloha Sportswear” and “Aloha Shirt” in 1936 and 1937. The there-button pullover shirt was the predecessor to the more relaxed, open-front Aloha shirt. With whimsical outrigger canoes frolicking around a tropical island, this was an early example of a Hawaiian-inspired print. Collector Evan Olins bought this shirt from a man who had purchased it during a 1935 working visit to Hawaii. T.H. Ho who got his start by making shoes and Palaka shirts for plantation workers, was also given credit for being one of the original Aloha shirt makers under the label Surfriders Sportswear. They had an Island Style retail store in the middle of Waikiki and produced many of the elegant shirts that are cherished by collectors today. When our book, “The Aloha Shirt”, was completed and off in Hong Kong being printed Herman Lemke, former Honolulu City Council Chairman and his son Rick introduced me to Rube Hauseman. Rube had written to local radio show hosts, Perry and Price, after Ellery Chun, who had been credited for creating the Aloha shirt had passed away. Rube claims he first started making shirts in 1935, contracting them out to Wong’s Products in Kalihi. He bought crepe, batiks and Fuji silk in vivid colored patterns from Musashiya. Rube was friends with many of the beach boys. Guys like legendary waterman Panama Dave, Colgate and William “Chick” Daniels. Rube recalls that after surfing, he and his friends would go eat Japanese food in Waikiki, and later go to their hangouts in downtown Honolulu. One of the hangouts they’d go to was the Rathskellar Bar, a popular spot for locals and visiting celebrities like Bing Crosby and other noted musicians of the time. Rube would give the beach boys the wildest, most vivid of his shirts to wear to the Rathskellar. Rube Hauseman has an interesting story about creating the first Aloha Shirts. He first gave them to the Waikiki Beach Boys, Panama Dave, Colgate, "Chick" and after surfing, they all would go to a downtown bar called the Rathskellar. The shirts were actually referred to as the Rathskellar Shirts after their debut. This version is quite close to Rube Hauseman’s recollection. Gumps ran one of the first ads for Hawaiian prints in 1935 initially for household interior decor. In 1936, Watumull’s East India Store commissioned Elsie Das to create 15 original Hawaiian prints. They were printed on raw silk for the home furnishing’s market and later Aloha shirts. Artists and designers began to interpret their island surroundings. Elsie and others started to create their own designs substituting what had traditionally been Japanese styled motifs and prints on the imported fabrics. Diamond Head was substituted for Mt. Fuji, Japanese pine tress changed to coconut tress, and thatched huts with ocean scenes and surfers, canoes on waves, canoes sailing, fish and flowers replaced bamboo, cranes, tigers and shrines that characterized the first prints from the Orient. Romantic island motifs and tropical imagery adorned these new casual shirts that reflected one’s encounters with this new dreamy and spirited tropical Paradise. Out in the middle of the Pacific, entrepreneurs pioneered opening new factories in Honolulu, then a Trust Territory of the United States. By the late 1930’s shirts were increasingly mass-produced and a growing selection of brands and labels were available. Aloha shirts were worn after a day at the beach in Waikiki, or to an evening moonlight luau and returned Stateside as a cherished keepsake and reminder of carefree island experiences. The tradition continues in Hawaii and well beyond her shores, encouraged by the acceptance of an even more relaxed lifestyle and more casual dress standards enjoyed around the world today.